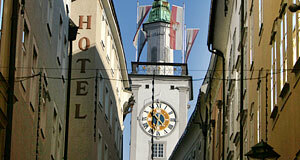 The Rathaus in Salzburg is a Medieval building with a Rococo façade and the former city hall. Since the current municipal government is located in Schloss Mirabell, the Rathaus is often called "Altes Rathaus" (old city hall) among locals. It can be found at the crossing between Sigmund-Haffner-Gasse and Getreidegasse, nor far from the Alter Markt square. The Rathaus is a four storey building with natural stone on the outside and some stucco work around the windows. The house itself is situated by the Kranzlmarkt, a little square running towards the Salzach River, from which it is segregated via an arch. The Rathaus would be one in many Medieval houses in Salzburg, if it didn′t have a little bell tower that is a very noticeable landmark in the skyline of Salzburg. The house was originally a burgher house, dating back to the 14th century. In 1407, the city council purchased it and started to use it as a court - both for the community′s government and as a court of justice, as indicated by the Justitia statue above the entrance. The tower of the Rathaus served the night watch as a look-out, as a clock and bell tower to provide a reference for time (the clockwork is probably the oldest in all of Austria). The golden age of the Rathaus were the late Middle Ages and the Reformation time, when civil-war like riots called Bauernkriege made the Prince Archbishops shudder with fear. This was the time when there was an actual power struggle between the burghers of Salzburg and the Prince Archbishop, who relied on their support in case of a siege (as it happened in 1525). Once Prince Archbishop Matthäus Lang had defeated the rioting peasants, the freedom of the city′s government was strongly reduced. Prince Archbishop Wolf Dietrich von Raitenau (the father of Salzburg′s Baroque appeal) finally constrained the mayor to a representative figure and little more than a high-ranking civil servant. This is the reason why the Rathaus is rather humble in comparison to the many palaces that the bishop inhabited in and around Salzburg. Under the rule of Prince Archbishop Markus Sittikus, the Rathaus was re-modelled between 1616 and 1618 (the Justitia statue dates back to this time). The Rococo stucco work was added in 1772. In 1947, the mayor and city council moved to Schloss Mirabell. Nevertheless, the Rathaus is still used by administrative bodies of the city for offices, with the exception of the ground floor (shops) and individual rooms. The former meeting room of the city council is popular for exhibitions and cultural events today. In 2006, a pot full of coins from the 17th century was found in the basement of the Rathaus.